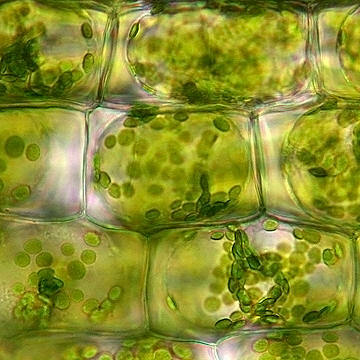 Plant cells rely on internal hydrostatic pressure to maintain their shape. This pressure is maintained by a relatively high solute concentration inside the vacuole, which results in the absorption of water from outside the cell via osmosis (Raven et al., 2007). As the vacuole swells with water, the protoplast increases in size and the plasma membrane pushes up against the inside of the cell wall, resulting in turgor pressure. The turgor pressure is counteracted by the call wall and these opposing forces help maintain the shape of the cell and ultimately support herbaceous plant tissues. The image below show cells in a leaf of Elodea canadensis that was placed in a solution of distilled water. 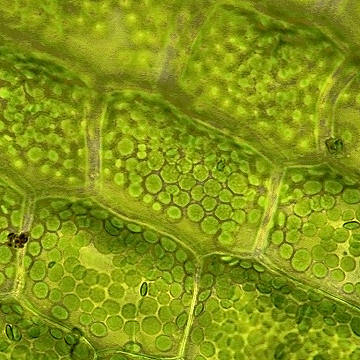 The small green structures are the chloroplasts inside the cells and notice that they are distributed near the cell wall. If a plant does not receive sufficient water or is placed in environment that is hypertonic (one that has a higher solution concentration than the plant cells, e.g. a salty environment), than the cells will lose water and the plants will wilt. This is because water will be drawn out of the vacuole through osmosis, the protoplast will shrink, and the plasma membrane will actually pull away from the cell wall (plasmolysis), resulting in a loss of turgor pressure. The following image shows an Elodea leaf that was placed in a 20% sucrose (sugar) solution. Note how the inside of the cell is shrinking and the gap between the plasma membrane and the cell wall (the cell wall does not shrink because it is somewhat rigid due to the presence of cellulose microfibrils). Raven, P.H., Evert, R.F., and S.E. Eichhorn. 2007. Biology of Plants, 7th ed. Worth Publishers, Inc., NY.